Fits very easily in our two door sports car. Seems comfortable and the padding is decent. There are only two complaints I have - 1) the seat padding is not machine washable. My daughter puked on it and it was a real pain to wash all the belts and the padding. 2) when front facing, you're supposed to keep it upright, so when my kid was sleeping, her head was drooping down on her chest (shes 1.5) and that did not look comfy at all! I suppose I could try to roll a towel in front to tilt it back more but there isnt really space to tilt it much in our small car. What is the width of this seat (at the widest point)? How much does this seat weigh by itself? 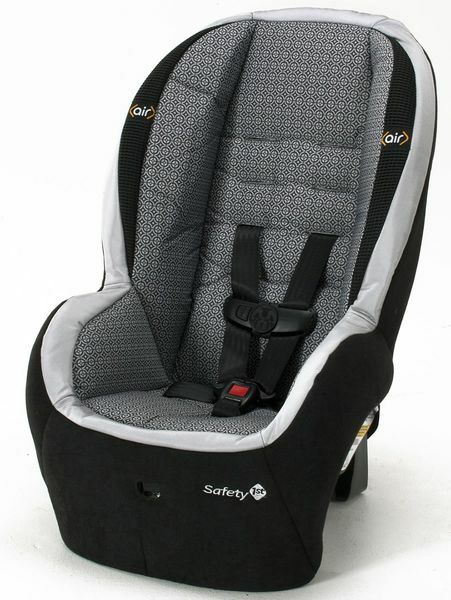 With the onSide air™ Convertible Car Seat by Safety 1st, you can keep your child rear-facing all the way up to 40 pounds! The car seat features our advanced Air Protect®technology for better protection around the head, where it's needed most. Air Protect® Advanced Side Impact Protection: shields head and immediately reduces side impact forces through the precise release of air.